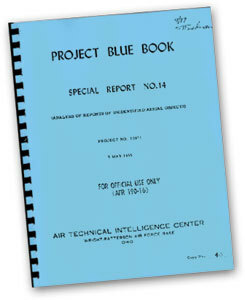 Project Blue Book was one of a series of systematic studies of unidentified flying objects (UFOs) conducted by the United States Air Force. Started in 1952, it was the second revival of such a study (the first two of its kind being Projects Sign and Grudge). A termination order was given for the study in December 1969, and all activity under its auspices ceased in January 1970. By the time Project Blue Book ended, it had collected 12,618 UFO reports, and concluded that most of them were misidentifications of natural phenomena (clouds, stars, etc.) or conventional aircraft. According to the National Reconnaissance Office a number of the reports could be explained by flights of the formerly secret reconnaissance planes U-2 and A-12.A small percentage of UFO reports were classified as unexplained, even after stringent analysis. The UFO reports were archived and are available under the Freedom of Information Act, but names and other personal information of all witnesses have been changed. The “Scientific Study of Unidentified Flying Objects” (Condon & Gillmor 1969; often referred to as the “Condon Report”) presents the findings of the Colorado Project regarding a scientific study of unidentified flying objects. It remains the most influential public document concerning the current scientific status of the UFO issue. Following is a short chronology of events that led to the Air Force contract with the University of Colorado to initiate the study. This extract is from: ” An Analysis of the Condon Report on the Colorado UFO Project,” by P.A. Sturrock, Center for Space Science and Astrophysics, Stanford University. Dr. Sturrock’s analysis is highly recommended as a comprehensive introduction to the text. Additionally, we have included many relevant links that offer further context for the reader. Two additional scientific studies that occurred within this timeframe deserve mention. 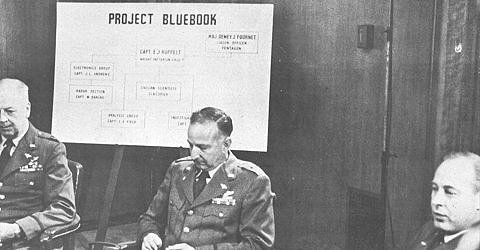 The death knell for Project Bluebook was heard in April, 1966, when the House Armed Services Committee recommended that the Air Force contract with a University for a scientific study of UFOs. On October 7, 1966, the Air Force announced that a program to study UFOs would be conducted by the University of Colorado and headed by Dr. Edward Condon. In reality, the Condon Committee, as it was called, had one task, and that was to provide a reason for the Air Force to end its official investigation of UFOs.